Later I switched to a Boston Mama and my friend, having tasted my Pyrat Passion, went with one of those. The Boston Mama features Bacardi Coconut Rum, Bacardi 151, Bacardi 8 Rum, coffee liqueur, fresh lemon juice, pineapple juice, and grenadine. While I enjoyed this tropical drink too, the Pyrat Passion was definitely my favorite. I love the flavor of passion fruit. You probably noticed that I name-dropped a bunch of rums when describing our cocktails. That's because RumBa has an extensive collection of different rums hailing from various regions (the menu is four pages long!). The Pyrat XO Reserve is a 15-year-old Caribbean rum from Anguila. The Bacardi 8 is described as slightly sweet and well balanced with notes of vanilla, toffee, and honey and comes from Puerto Rico. It's so interesting to learn about the different rums just by perusing the menu. As we sampled the signature cocktails, we also got to try some of RumBa's menu items. We snacked on delicious dehydrated veggie chips at the table. The tomatoes were especially sweet and flavorful and made me crave tomato season more than ever. Grilled lamb sliders with merguez seasoning, arugula, spicy mint cucumber yogurt dip, and feta cheese were delightful. I had no idea I was being handed a lamb slider, but as soon as I took a bite, I got that wonderful flavor and knew for sure that's what it was. And I don't think one can ever go wrong with some feta cheese, especially paired with lamb. The tempeh sliders also had feta cheese, along with baby spinach and kalamata aioli. These make a suitable vegetarian option but wouldn't be my go-to -- only because there were other options. I mean, there were lamb sliders. And there were lobster sliders. The lobster sliders would be my go-to in a heartbeat -- creamy, fresh lobster salad with crispy, salty bacon. Yes, please. From where we stood in the bar, we could look out at RumBa's waterfront bar area, which would be a great place to hang out when the weather warms up. If you're a fan of rum or bubbles and love little bar snacks like sliders and shrimp tempura, you should definitely check out RumBa. This was my second time there, and I really enjoyed the atmosphere, food, and cocktails. 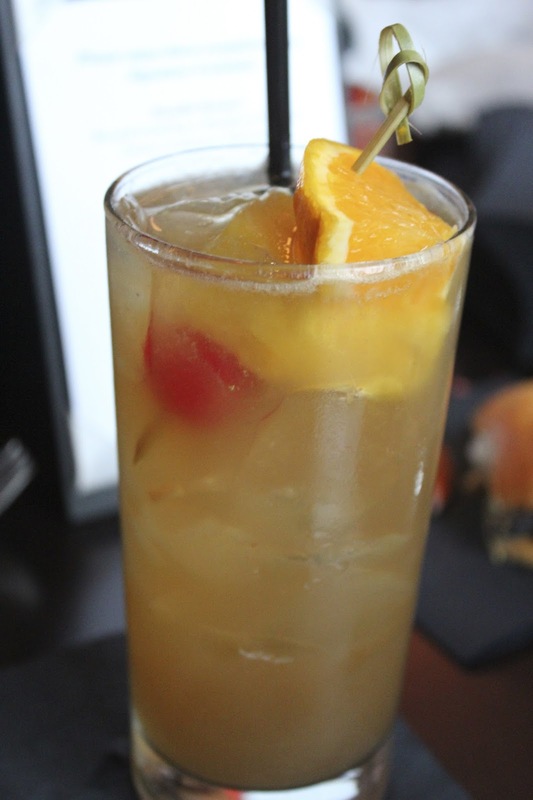 What's your favorite rum drink or type of rum?